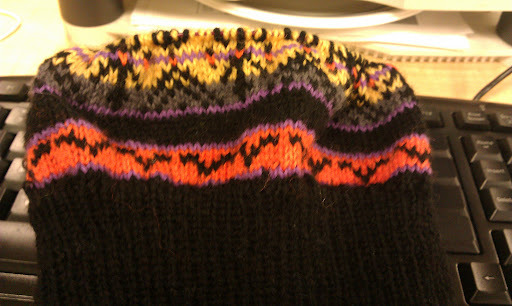 I am definitely suffering from a case of knitting ADD lately. I must have something like seven or eight WIPs lying around right now, not to mention all the things I've started, done a couple hours work on, then gone, "Nah..." and pulled out. I get this way from time to time. Unfortunately, the times when I get in a "finish ALL the things!" frame of mind...do not occur at a 1:1 ratio with my Start-itis fits. In unrelated news, I think I may be catching the flu. And it may have been a grave tactical error saying, firmly, "For heaven's sake, girl, you're awake, you might as well just get going, you KNOW you'll be fine by the time you get to the office!" Which is usually quite true. When I stay home because I feel a little seasick, I am generally 100% fine by 6:30. Today, I seem to be getting queasier and queasier. And now I feel hot. Although of course, I'm also DWELLING on how I feel, which has a way of INVITING such things. Like when I start whining about how my hip hurts, SO NATURALLY my back starts up too...OR DOES IT?!?! ...I strongly suspect my back is a gah-danged liar sometimes..
ive got about six things going right now; probably more if i sat and thought about it. but the Clapotis and its matching mitts *must* be done by Thanksgiving, and it would be nice if the Mitered Crosses Blanket were done by then too. the other stuff is just stuff. ps- my verification word is "frogrus". must be a message. I have the opposite problem. The Willow sweater is nearly over (I just have to sew it up and knit the neck band) and I can't decide what to make next. Problem is: 75% of my stash is in storage so even if I fancy making something say in the white merino-angora blend, it's out of bounds. PBear quote: If you can count your WIP's, you don't have enough. This will now become my new motto - for knitting and life. Crazily, I also have quite a few things going, which is not my norm...surprise dh socks at the office, mittens on the couch (still need to sew a button on the matching hat), a ripped out "shaun the sheep" hat and tail also on the couch which must be finished by next weekend for Boo at the Zoo... Craziness. And, a freaking cold which I'm pretty sure I've given to my 11-month-old. Doh! I feel your pain! A knitter's way of saying "ummmm..."